Republicans’ failure to repeal and replace Obamacare like they promised to do for seven years means that tens of millions of Americans who are already financially crippled by premium increases and high deductibles as a result of the law will continue to be economically brutalized. As reported by the Los Angeles Times, the coming rate increases are exemplified by one Denver couple, both electrical engineers who retired five years ago. The Hansens, who had put away a decent nest egg for their retirement, found themselves decently priced insurance that seemed reasonable to a couple in their late 50s, the paper noted. But then, as Obamacare kicked into overdrive in the years since, insurance prices have risen dramatically. Since 2015, the Times reported, their private insurance premiums have more than tripled and are expected to cost the couple almost $18,000 in 2018. “It just doesn’t make sense,” said Jim Hansen, who now has had to recalculate retirement finances. The Affordable Care Act made life-saving protections available to millions, many for the first time. But the transformation of the nation’s insurance markets has been a bumpy ride, particularly for one group — people like Hansen who get health insurance on their own, rather than through a job, but whose income is too high to qualify for government aid. Now, these same consumers, whom Republicans have held up as victims of the current law, stand to see insurance bills soar even higher unless Congress acts quickly to stabilize insurance markets that have been weakened by the Trump administration. This kind of revisionist history might play well to the insanely Left-wing readership of the Times, but the paper’s attempt to lay this debacle at the feet of anyone other than Democrats is outrageous. First of all, there is the fact that not a single Republican voted in favor of the Affordable Care Act. So there are no GOP fingerprints on this bill at all. Secondly, there is no data to prove that Obamacare has proven to be “life-saving” for anyone who got coverage “for the first time” under the law. No data whatsoever. So that claim is the Times’ reporter making a personal observation, not a claim of fact. But there is data proving that the ACA has saved NO lives. How much of that was due to Obamacare? The Congressional Budget Office puts the figure at $1.1 trillion. Perhaps the Times doesn’t realize that when the country collapses under the weight of its debt, nobody will receive healthcare — except maybe the “rich guy” at the top who owns the paper. Fourth, Congress would have already passed reforms to Obamacare that would have helped lower insurance premiums if a few Democrats — just a few — would have bothered to support the two reform bills that have already been proposed. So we could say, in truth, that not only have Democrats given us this monstrosity, they are now ensuring that we continue to be burdened by it. Fifth, why has “transformation” of the nation’s health insurers “been a bumpy ride?” Wasn’t Obamacare sold as the end-all, be-all of health insurance and healthcare delivery reform? Why, yes. Yes, it was. And several other lies the president and his Democratic congressional allies told about the law. Finally, “insurance markets that have been weakened by the Trump administration?” I wasn’t aware that the Times allowed its reporters to smoke crack on the job. The entire private health insurance industry was weakened by Obamacare — which, in review, was passed without Republican support. So again, how is any of this Trump’s fault? 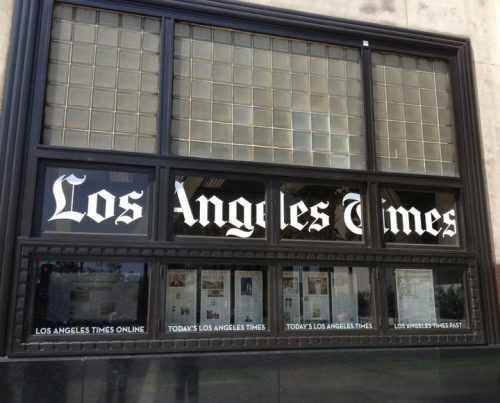 Fakestream media outlets like the Los Angeles Times are contributing to the downfall of American society, and this is a huge example of how they’re doing it. They are not public servants, they are enemies of the people. It’s just too bad more Americans can’t see it.